Semi-arid scrub savanna; rock outcroppings. Crepuscular, meaning they are active in the morning and evening. The average life span is 12.5 years. A heavy bodied snake with a blunt, wedge-shaped head that is used for burrowing. 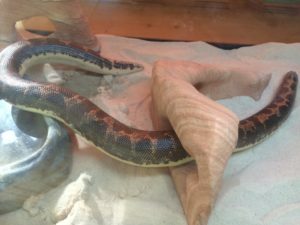 The yellowish-white to orange colored scales are smooth and glossy with blotches of brown, reddish-brown, or mahogany. Adults can grow up to 32 inches in length. 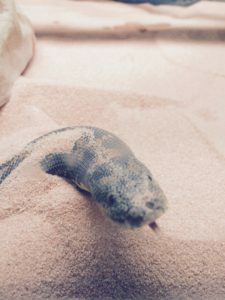 The Kenyan sand boa spends most of its time in shallow burrows with only its head exposed. 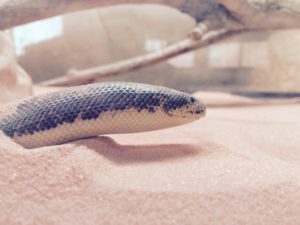 The snake’s eyes and nostrils are located in such a way that they remain free of debris when the snake’s body is hidden beneath the sand.